Tax Doesn’t Have To Be Taxing for Tradesmen, Does It? 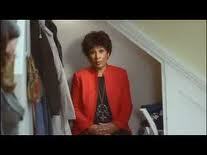 I’m sure that when Moira Stewart was doing the HMRC ad campaign she didn’t find her tax return taxing at all, but then I doubt she was ever confronted with filling in a 64-8 form or an SA1 and you can forget about National Insurance schedules. The idea behind this article is to give you, as a self-employed, CIS or PAYE Tradesman, a clearer view of the murky world of tax. Hopefully this will help you understand that whilst self-employment isn’t something you should fear, self-assessments aren’t something you can afford to ignore. From speaking to various professionals across the construction industry and domestic trades, (even those that have completed endless training and classroom based qualifications) it’s become clear that very few curriculums make very little (if any) reference to getting started as a self-employed worker, your tax liabilities and/or legal obligations and of course, your tax refund entitlements. When you look to start your life as a self-employed Tradesman, you’re basically left to your own devices. You have to take on the daunting task of attempting to find your way around the virtual labyrinth of the HMRC website and we can tell you from experience, that even for tax professionals, it’s not the easiest site to navigate. As a result, it seems that there’s a genuine “what if I do something wrong?” fear amongst Tradesmen, so it’s no surprise that many self- employed Tradesmen delay doing tax returns and in a lot of cases, avoid doing them altogether. The other thing we encounter with alarming regularity is PAYE Tradesman who’ve been on the books permanently with a company for 2, 5 or even 10 years being hounded by HMRC for outstanding returns and payment for fines on their account. However, a lot of these people have never actually worked self-employed or under the CIS scheme and some had no idea they had even registered for self-assessment at all. Most common are those that have registered but weren’t aware that they had to pro-actively contact HMRC to remove themselves from the self-assessment database once they had started working PAYE again. The problem with each of the scenarios for Tradesman in both self-employment and PAYE is two-fold. Firstly, you’ll incur an immediate set fine of £100 for a late return, on top of which you’ll also receive ongoing fines which gain interest at a steady rate for each tax year you fail to complete (Please see below for a breakdown of penalties for late returns). This can even go as far as HMRC placing a determination on your account, which will leave you thousands of pounds in the red. Second, and more importantly to you, if you’re a self-employed Tradesman paying CIS tax, the chances are that you’ll almost certainly be entitled to a refund worth hundreds or even thousands of pounds from HMRC for tax overpaid. But what if you’re PAYE Tradesmen? Don’t worry we haven’t forgotten about you. What we’ve found from speaking to a number of people ‘on the books’ or ‘cards in’ is that they’re not even aware that they may be entitled to a tax refund. Admittedly, this isn’t always the case but if you’re PAYE and incurring expenses as part of your job, again, you’re almost certainly entitled to something. As every individual case is unique, it’s very difficult giving specific advice in a generic article like this, which is why we are always happy to receive a call and discuss your circumstances to give you an idea of whether (and indeed how) we can help you. Even if you’re just looking for some general tax advice, just give us a call. We’re a very small company of tax specialists and all of our advice is completely FREE, with no obligation attached…just a chat with someone who can hopefully help. Below we’ve attempted to address a number of the most commonly encountered questions we get from our clients and the things we believe should be clearer. How do I register for self-employment and self-assessment? You can contact HMRC on the CIS helpline 0845 366 7899 and/or Complete SA1 form to apply and subsequently obtain your UTR (Unique Tax Reference) Number. Once you receive that, you’ll need to call again and activate your account to start working as a self-employed professional. What happens if I fail to complete a tax return? 1 day late A fixed penalty of £100. This applies even if you have no tax to pay or have paid the tax you owe. 3 months late £10 for each following day – up to a 90 day maximum £900. This is as well as the fixed penalty above. 12 months late £300 or 5% of the tax due, whichever is the higher. In serious cases you may be asked to pay up to 100% of the tax due instead. These are as well as the penalties above. Do I need to keep all my receipts? How do I know if I’m entitled to a tax refund? Regardless of whether you’re CIS or PAYE, if you incur expenses as part of your job, i.e. travel to work (not just between home & ‘the yard’ for PAYE), buy your own tools, work clothes, industry specific training etc, then the answer is yes you are. Who do I speak to about doing my tax return and claiming my refund? Well, we’d obviously suggest that you speak to us. 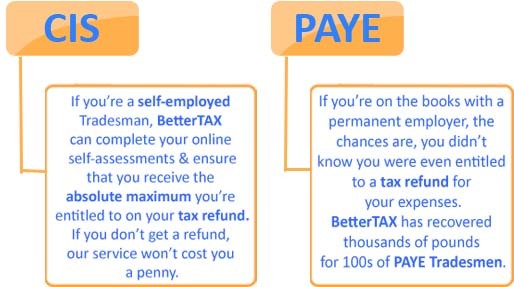 Bettertax are tax refund specialists and work exclusively for Tradesmen. The idea behind the company was for us to assist guys in the trade with the recovery of overpaid tax, their business expenses and managing their dealings with HMRC. Don’t just take our word for it, see what other workers in the trade are saying about us on the Freeindex, where we’re ranked as the best Accountancy firm in the UK alongside others that don’t understand you or your trade in the way we do. What we offer is a hassle free service, giving our clients peace of mind that if were not able to secure a refund for them, they won’t pay us a penny. In a lot of cases, we have clients that come to us with existing fines and/or determinations on their accounts and again, we don’t take a penny until we’ve managed to clear the fines and get them a refund. We know everything you buy, everything you can claim and of course the best way to claim it, so we can maximise the tax refund you receive. For more information feel free to call for a no obligation chat! Home » Blog » Tax Doesn’t Have To Be Taxing for Tradesmen, Does It?